Leader of the Opposition Julian Fraser is this afternoon claiming that there is a ‘serious issue of trust’ within the Opposition Virgin Islands Party (VIP), adding that deception was used to unseat him last November as Chairman of the political organization. Fraser’s claims may prove troubling for his party’s recently elected chairman, Andrew Fahie, who has been battling suggestions that he is not trustworthy. Fraser’s claims are also the latest salvo in the dispute he has been having with Fahie since both men clashed for chairmanship of the VIP last November. Fahie won the internal election (52 /22 votes). But Fraser is now claiming that the delegates were conned. “In a well thought-out carefully orchestrated plan, some members of the Virgin Islands Party deceitfully unseated me as Chairman of the Party and, by now, most if not all delegates should have known they were conned,” Fraser said. Fraser added that – although the VIP Constitution does not mention ‘Leader of the Opposition’ – persons are giving the false impression that it does, in their attempt to satisfy their lust for power. “Throughout this whole power grab I’ve seen and heard many falsehoods. I’ve heard that the leadership of the Opposition comes with the Chairmanship of the party… which is BS,” Fraser further said. Fraser said residents should also consider it an embarrassment that the VIP has asked Governor John Duncan to remove him as Leader of the Opposition, and instead appoint Fahie to the post. “Running to the Governor [to choose who should be Leader of the Opposition] is an embarrassment to this territory, which every man woman and child living in these Virgin Islands should resent. It paints the false picture that Virgin Islanders are incapable of handling their own affairs, Fraser further said in a wide-ranging comment posted this afternoon on his Facebook page. 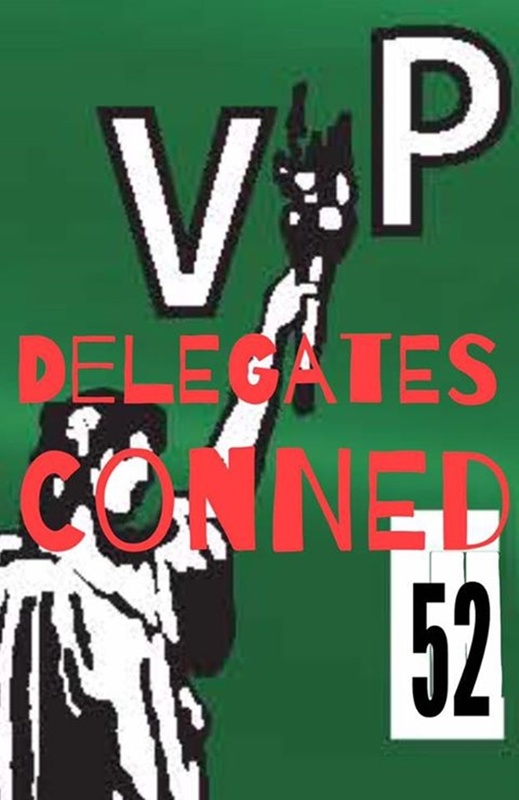 In a well thought-out carefully orchestrated plan, some members of the Virgin Islands Party deceitfully unseated me as Chairman of the Party and, by now, most if not all Delegates should have known they were conned. Delegates were led to believe that the chairmanship of the party came with the leadership of the Opposition – which was and is a big lie. And neither is the appointment of the Leader of the Opposition a political appointment. Delegates are advised to check for themselves and see if anywhere within the 35 pages of the VIP Constitution can “Leader of the Opposition” be found. Never once is it mentioned. The only people talking about it are those whose lust for power would stop short of nothing to get it even if it means destroying the Party in the process. Throughout this whole power grab, I’ve seen and heard many falsehoods. I’ve heard that the leadership of the Opposition comes with the chairmanship of the party.. which is BS. Where were these same people when I became Chairman of the Virgin Islands Party in May 2014, and the former Chairman (Ralph T O’Neal) continued to hold on to the Leader of the Opposition post? Also why was the attempt to wrestle the Governor into denying the Chairman the Leader of the Opposition post after the 2015 General Elections? By now, Delegates of the party and certainly the public at large should realize that trust is a serious issue within the Virgin Islands Party. Running to the Governor [to choose who should be Leader of the Opposition] is an embarrassment to this territory, which every man woman and child living in these Virgin Islands should resent. It paints the false picture that Virgin Islanders are incapable of handling their own affairs. Let me be clear. The Governor has no role to play in this matter, neither constitutionally or otherwise. So the Virgin Islands Party must know that the leadership of the Opposition is not some politician pawn to be pushed around by the Governor to suit their convenience. I want to point out a series of inconsistencies and untruths that continue to permeate the media without the benefit of any form of fact check. This is what the VIP continues to feed. The governor never said that the Chairman of the Virgin Islands Party should be the Leader of the Opposition. It’s not his call to make. If that was his position, where was he when I was Chairman from May 2014 to June 2015 while Mr O’Neal was Leader of the Opposition? Another falsehood. “Why is this important Constitutionally, as Opposition leader, you are chairman of the Public Accounts Committee”. This is not true. The Constitution does not make the Leader of the Opposition Chairman of the Public Accounts Committee. That is a function of the Standing Orders of the House of Assembly. It is clear that the use of such false statements are designed to mislead the uninformed. As the Leader of the Opposition, the VIP are saying: “You are responsible for submitting the names of persons, in representation of the Opposition, to fill posts on numerous committees and statutory boards. It is fitting that all members of the Opposition must have some form of input in such selections, and at a minimum must be informed when these posts become opened and definitely when submitted and filled.” This is the VIP’s statement which can be argued. What do they mean by representation of the Opposition? If by that they mean the views of the Opposition, that’s a definite misconception, for it would require having to instruct the nominees on decisions, and I would hope that any self-respecting individual would resent such behavior. These are not political nominees. These people are placed on Boards to execute the policies of the sitting Government, and not to hinder or obstruct the functioning of the Board or to grant political favors. All this hullabaloo about appointments and how they should be made, begs the question: What was happening in the past under Hon O’Neal’s tenure as Leader of the Opposition! And where were they. For two terms I sat in the Opposition, and never once was my input on a nominee asked [for], and neither was I asked to submit an individual as a nominee. The legislation requiring a nominee bestows that privilege to the Leader of the Opposition – not anyone else.